The steam engine that is rock band Foreigner is racing full steam ahead. 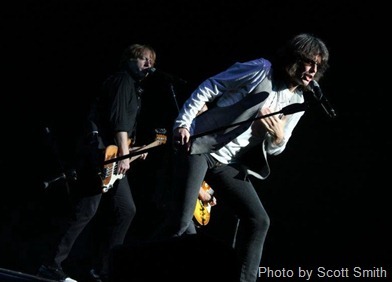 Even without the presence of founding guitarist-singer-songwriter Mick Jones — the 67-year-old Jones recently had heart surgery and is recuperating away from the stage — Foreigner put on a solid concert on April 10 at the Walton Arts Center in Fayetteville, Arkansas. The event was a fundraiser for the Level 3 Neonatal Intensive Care Unit at the Fayetteville-based Washington Regional Medical Center, and showed Foreigner to be tight and ready to deliver the hit singles. Jones’ trademark, punchy riffing that drove the studio versions — and recent tour versions of — “Feels Like the First Time,” “Urgent,” “Juke Box Hero,” “Dirty White Boy” and “Urgent” all came from Bruce Watson, a fill-in guitarist for the departed Jones. Lead singer Kelly Hanson and bassist Jeff Pilson bonded to help keep the front-of-stage energy up on the up-tempo cut “Head Games,” and multi-instrumentalist Tom Gimbel played the haunting piano introduction of “Cold As Ice” that usually is played live by Jones. Resembling a taller version of Journey’s Neal Schon, Gimbel blew terrific, dirty-sounding saxophone for “Urgent” and played key rhythm parts on his Les Paul. Giving the songs a stomping, dependable beat was drummer Mark Schulman, while keyboardist Michael Bluestein provided moody atmospherics, sound effects and crucial piano parts. The band even did a mostly acoustic version of “Say You Will” that was greeted with some of the most screams, cheers and whistles of the night. To be fair, Watson seems as equally gifted as Jones as a guitarist and performer. Boasting a thick, curly mane of hair, Watson ate up every chorus and verse in the roaming, multi-colored spotlights with grins and 110-percent effort. Despite Watson’s gifts and warm persona that can be found both on the stage and in the band’s dressing room, Jones was missed. Usually bespectacled with white, sky-pointing hair, Jones resembles a cool-looking, rock-and-roll version of a Koala bear. Let’s hope that Jones quickly bounces back to strong health, rejoins Foreigner for more tour dates and adds Watson as a full-time member. Not one original member playing.